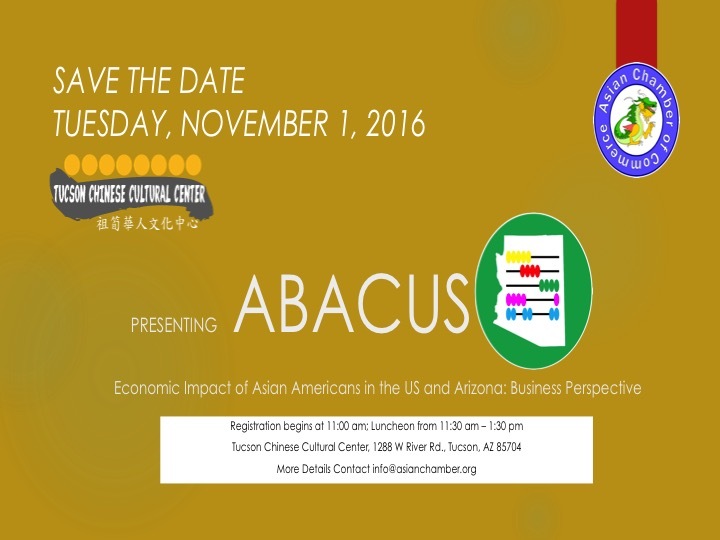 “On November 1, 2016, the Asian American Chamber of Commerce will present Abacus, an economic survey identifying the growth of Asian American owned businesses and the impacts of the Asian American community in the US and in Arizona. Committed to supporting and enhancing relationships and collaborations, the Chamber appreciates the support of the community in this vital project. Due to the high demand of requests, the presentation will be held from 11:30 am – 1:30 pm, at the historical Tucson Chinese Cultural Center, located at 1288 W River Road, Tucson, AZ. Registration will begin at 11:00 am. In the last few years, the Chamber has noticed an enormous increase of Asian Americans as well as Asian American owned businesses in Arizona. The recent US census data indicate a 95% increase of Asian Americans in Arizona (2010). With only 4% of the Arizona population, Asian American businesses bring in more than $4.5 billion of revenue for Arizona and the higher 30% Latino population produce $8 billion (2007). This shows Asian Americans’ significant economic leveraging power and potential. About 900 people today at this luncheon, the first in Tucson for the Arizona Asian Chamber of Commerce, mostly Asian and Hispanics in attendance such as the Mexican Consul, former state Senator Victor Soltero, LD 9 House Rep. Macario Saldate, former Supervisor Dan Eckstrom, PCC Bd. member Sylvia Lee. Welcome by Jim Shee, Asian Chamber President, Peter Chan of TCCC, then Mayor Jonathan Rothschild, all speaking about the significant power & potential/contributions of Asian Americans. Young James Kai, grandson of John and Mamie Kai who donated $ to build the TCCC, spoke of his immigrant family toils and tribulations, overcoming prejudice as Chinese immigrants. MC Raul Aguirre spoke of the connections between Chinese and Mexican cultures & peoples in Arizona. 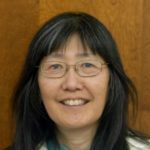 Dr. Naomi Story reviewed history of some famous Asians in Arizona such as Dr. Hank Oyama, Wing Ong (1st legislator), Lai Ngan (ancestor of Sylvia Lee), Lorraine Lee of Chicanos Por la Causa, plus unsung heroes/heroines. Bulk of info on ABACUS was then presented by Dr. Loui Olivas of ASU with lots of graphs/charts on Asian power and growth in U.S.: 240,000 Asians in Arizona, 35,000 in Pima County, with increasing Asian buying power and purchasing power(all on flashdrive, website later). Then Glenn Iwata of WestGroup Research gave an “owner’s-eye view” of Asian businesses based on a survey of 100 Asian owned businesses. Conclusion that this is a “quiet, powerful group”, doing $12 Billion sales revenue in 2012, but 1/3 faced discriminatory issues, language difficulties. He then briefly interviewed two immigrant Asian women business owners in Tucson – Ann Klocko (Korean) doing trade/student exchanges and Tina Liao (Chinese), environmental construction & engineering, both passionate women with language barriers facing immigrants. Keynote speech by Chancellor Lee Lambert was where Pima Community College is going with global studies, J.A.D.E. (Justice, Advocacy, Power Enterprise), “diversity in diversity” initiatives. He noted that 50% of Asians in Tucson have bachelor’s degrees, compared to 26% of the rest of the population, emphasized job training & small business development for the future. Program closed by Janell Cavero Harnal, ABACUS Director who spoke of the legacies of founders Madeleine Ong-Sakata (ailing) and Dr. Ted Namba, who passed away this summer. Donations of kids bikes to the TCCC from the Asian Chamber of Commerce. Don’t miss this lunch & talk on Tues.November 1st at the beautiful Tucson Chinese Cultural Center. Registration starts at 11 a.m.